I had a burst of creativity hit me tonight as I was getting close to finishing (other than clouds) the removable backdrop in front of the passenger staging tracks. I decided to extend the closer trees on the portable backdrop down the side of the layout to blend the two together better. 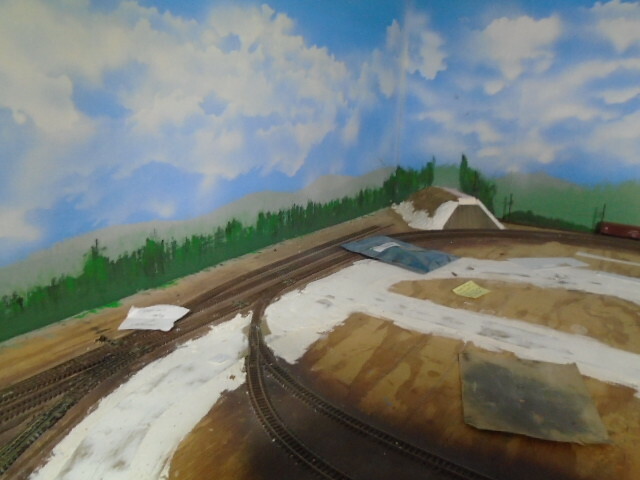 Most of this area is only a few inches wide at best with some literally the only scenery is paint on the backdrop (like at the far end where the electrified interurban spur is). I also added some look of depth/perspective where the highway and Portland Traction Co. line hit the backdrop so it it looks like they go somewhere. On both of these backdrops there will be a number of structure flats, some "thin" trees and the like, but since the scenic depth is shallow I need all of the layers I can get. Well, sometimes things don't work out that well and in your attempt to go forward you end up six steps back. I rooted out my cloud stencils and was spraying them on and they weren't going on a well as the others did. I realized then all of the old ones were done vertically, so I figured I'll just paint these out and start over. Well, managed to snag one of the dowel supports and knocked it off the worktable, which upon impact broke apart on a seam, and like butter on bread, a third of it flipped wet paint down onto a dirty garage floor. . I then realized I had just hot glued the pieces together years ago when I built this thing instead of wood glue. . Got out the glue and clamps for a proper fix. I scraped off the dirty bits and managed to repaint the sky and touch up the tree line a bit. All is left to do is to fix and repaint the seam, so I can get this bad boy in the locating holes and leave it. 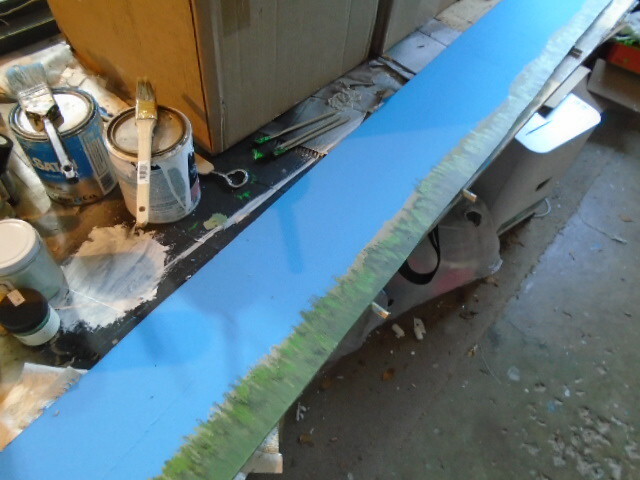 While I was routing around for some scrap, I did find a piece of painted backdrop. I cut it down, added a bit of trees to it since I had the tree paint out again, and a wood support and completed the backdrop that will abut a bridge disguising my west-end staging yard. You could have put this incident in the "Has this ever happened to you?" thread and it'd fit right in. 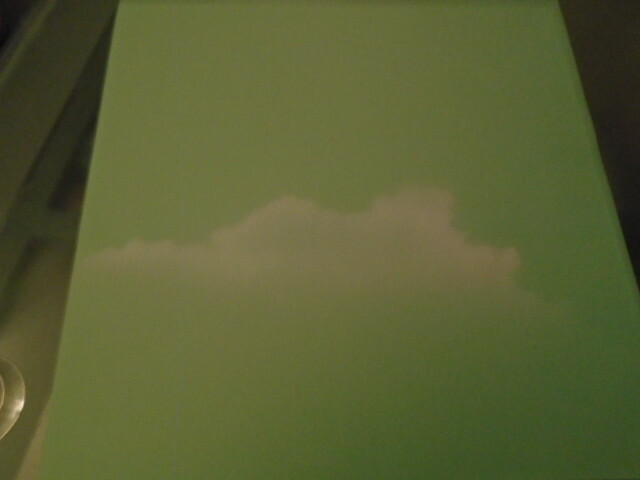 Ended up buying some new white spray paint and that did the trick for the clouds. They went on as easy as the original batches. While I had the newspapers and the paint out I painted the trackage in the Brooklyn yard/terminal area with a mixture of oxide red/black spray paint. I remembered to mask the turnout points but failed to do that for the IR detectors, but just a bit of scraping I got everything to work. 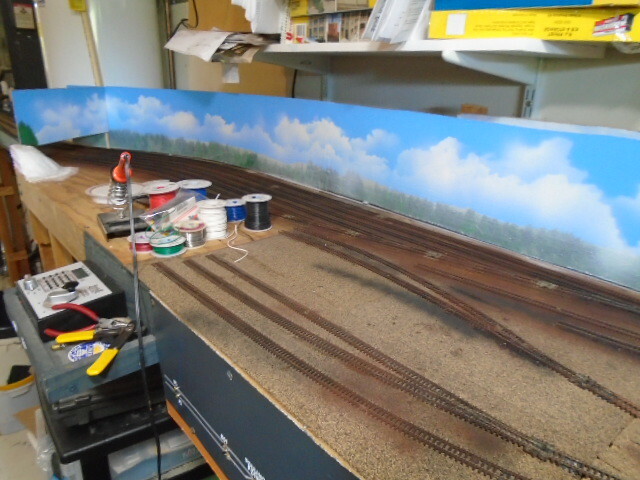 So now all of the backdrops are done and all of the laid track is painted. 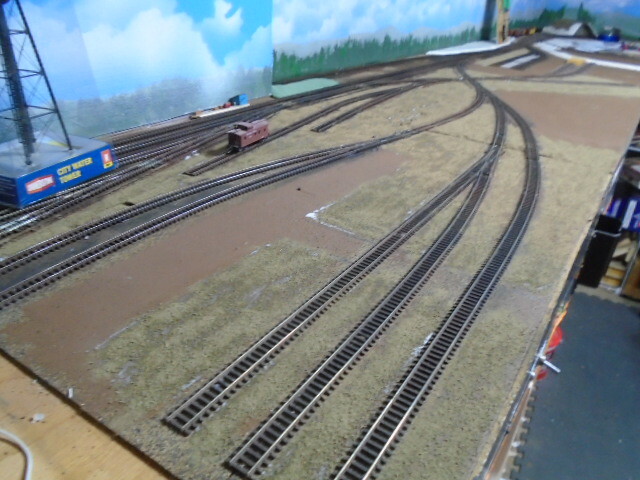 Outside of the remaining turntable area there is just the wharf and one spur realignment to go for the track gangs. 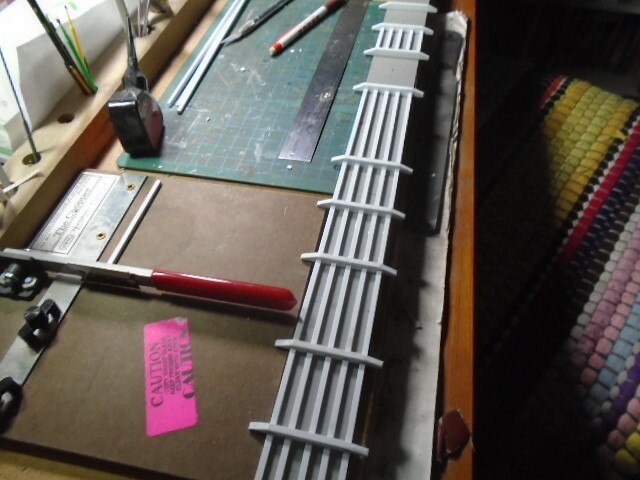 I bought some unsanded grout as there are a couple spurs where the track is just rails and dirt as I'd like to try that technique as i start working on the scenic base ground before any ballasting occurs. The clouds look great, Peter! Would you mind illustrating for us your technique? No problem, I took a few minutes and took some quick pics. 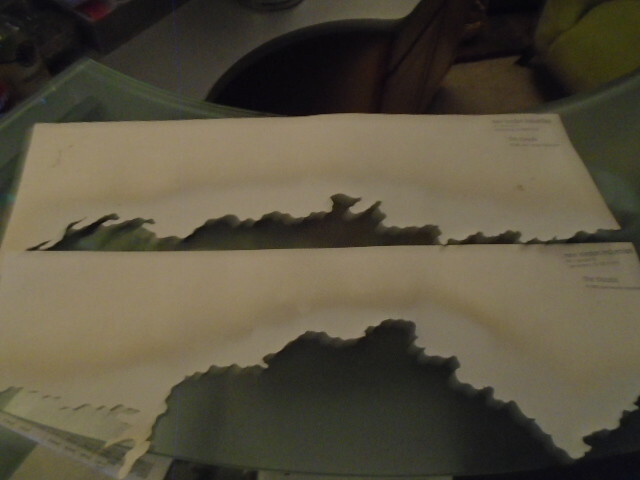 I use cloud templates from New London Industries that I bought back in 2004 which are just on heavy paper. It took me probably around 5 minutes to paint the clouds on that backdrop. You could make them yourself as long as you varied the top edge with a lot of random cloud-like puffs, knobs, but no straight lines. The paint is Rust-oleum 2X Paint & Primer flat white - any flat white will do as long as the nozzle is clean otherwise you'll end up with drips or spatters. Pay no attention to the green sky - I didn't have any blue paper on hand. The photos are a bit dark as its night and the camera flash just wipes out the details otherwise, but enough shows to illustrate this. The template is held close to the backdrop and do a pass left to right concentrating on the patterned edge and apply a heavier band across the top. The spray will naturally fade out the further away it gets. The important thing is to have heavier application on top and less on the bottom, so it naturally looks darker like the cloud underside without using any other colors. 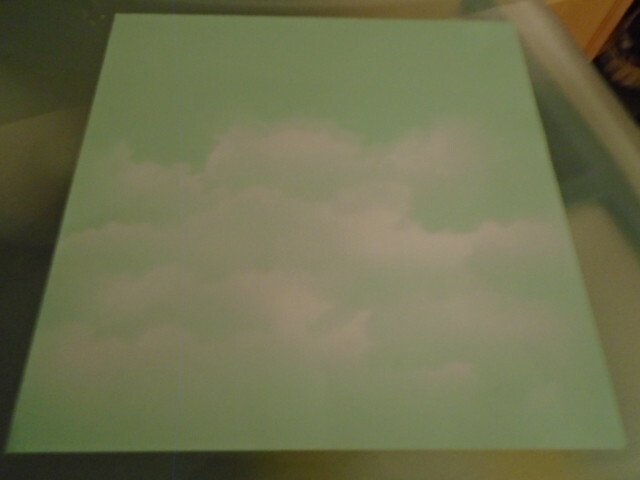 Keep layering the clouds using different parts of the template or different templates to get a good mix. Its usually easier to start at the top and layer them down to the horizon or a bit above if you have hills already painted. The result is a natural look without any heavy-handedness. While I have a "partly cloudy "day going you could easily vary this from a few clouds to a lot. Tonight I got the first layer of fine dirt down in the Brooklyn Yard terminal area. A good portion of this will be covered up by gravel and ballast , but I need to get some layers down first (ballast on top of dirt versus the other way around). I left some brown painted areas alone for now as placeholders for access roads and larger structures such as the yard office and the blacksmith/machine shop/boilerhouse. I figure I'll scrape this off as needed for smaller sheds and supporting details (tanks, bins, etc). It's finally great to get away from the look of plywood! I got the base-level scenery in place around the outer yard storage tracks (MOW and store houses) with the first greenery on the whole layout. This is also the first ballast that I have laid down in 30 years - it went a whole lot easier thanks to real rock ballast and use of rubbing alcohol to pre-wet. I read somewhere ( I think on MRH) that use of a gravy separator works well , which it does to give great control when pouring it on. No fancy tools here - re-purposed make-up brushes and a pipettes of diluted matte medium out of a Skippy peanut butter jar lid . I've been putting off the ballast for a while now , kinda like I did with decalling - but once you get over that first hump, everything just falls into place. 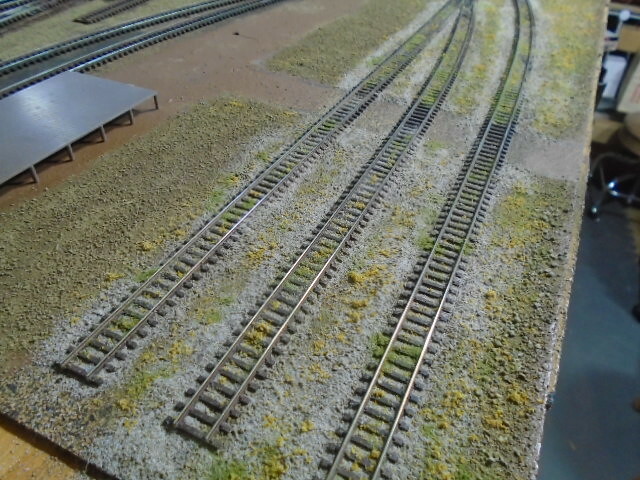 These tracks uses a 50/50 mix of ballast and dirt plus a bit of ground foam for yellow and green short weeds. I'll add tufts and taller grasses after the building and other details go in. I started on another new roadway bridge... this time a two-lane 1920's era concrete viaduct. While I'll use Rix roadways and railings, the columns will all be square with lots of triangle gussets. The picture shows the beams being laid out. I first glued all of the roadway sections together then drew the locations of all of the bents following the prototype pattern which had long or medium spans separated by pairs of short spans. The longest spans crossed over the SP tracks and the adjacent streets. I also drew some lines to help me locate the beams. The viaduct is bit further along with the beams, longitudinal gussets and columns added...starting to look like something. Here's the first test fit for clearance and placement. The New Haven interloper will become one of the two Osgood-Bradley cars that were assigned to the SP in the mid-50's (yes I know that this is not an exact match for the SP/SSW cars but since those cars were cancelled in HO, I plan to roll my own for now). I still need to add the transverse bent gussets, sidewalks and railings before this can be painted and weathered. I finished touching up the embankment with lightweight spackling so this can have the rest of the base scenery placed on it soon. Are those triangular gussets or are the lateral beams arched? Need a close-up shot. The lateral beam are "arched" with straight triangle sections in the corners as per the prototypes. It was easier to make up triangle "gusset" pieces and glue them to straight beams instead of cutting a straight-arched section from a solid piece. I did the same with the columns that was done after these pictures. I like the way this is shaping up. I may have missed it, but what is going to happen under the bridge? Thanks Gary! The bridge represents a transition zone between urban industrial and "suburban" industrial. . I've been adjusting things around as new information comes to light, so my current thought of what is going here is somewhat different from when I started this thread. The spur that you see ending in the street in the picture will be realigned and extended under the bridge to the right of the street to serve a small lumberyard. At the far right will be the long-planned old flour mill-turned burlap bag factory (the new smaller Walthers elevator kit will provide the silos which actually match the prototype). Between the bag factory and the bridge will either be a Portland General Electric substation (goes with the powerhouse across the tracks) if I can find some decent transformers and other electrical equipment or a utility pole yard. To the left of the street and behind the bridge will be a couple bungalows in the classic Portland style (this is that suburban industrial with houses on one side and a dairy complex on the other).